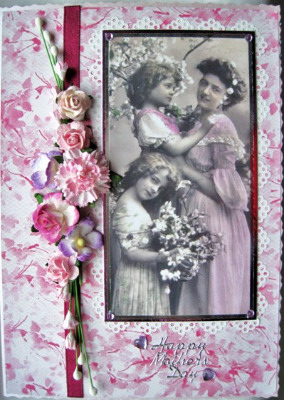 This enchanting vintage-style pearl pink deckle-edged handmade card 127 x 178mm has phototint of lady and two girls with Spring blossom, mounted on pink mirror card and edged with cream paper lace, matted on a pink floral background. It is finished with a spray of paper flowers set on a cerise satin ribbon, and the words 'Happy Mother's Day' decorated with two heart gems. We can change this to 'Happy Birthday' or 'With Love' or similar; please specify on the form below. Please choose wording for the printed paper insert below.